Water is still very hot everywhere in the lake, as in over 70 degress on the bottom except in McGee Bay, Crooked Creek and the mouth of the Owens, which you can't get to by boat. 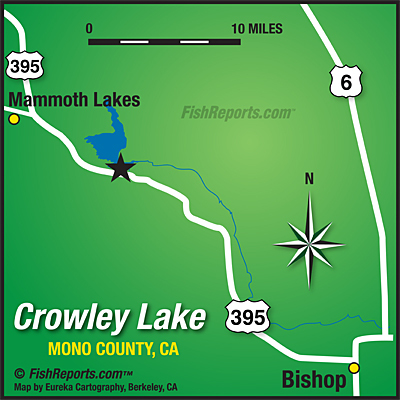 McGee Bay has some near perfect 58 degree water inside against the weedline and more big fish are showing up daily. The underwater stream channel has disappreared (silted out) so there is no concentration of colder water following the old channel out into the bay. The cold water goes about 100 feet from the mouth in what's left20of the channel and then just dissipates over the entire bay wih no real concentration. For McGee fishing has turned wide open for the last two days at least inside along the weed line. 'Haven't had time to look outside much as the average soak time from cast to grab is less than a minute for a full two-three hour bite with steady, less-than-three-minutes between grabs coming and going on and off the bite for an hour on either end. Perch fry slashing on the surface from first light but very few people are stripping from tubes?????? I've managed a few stripping from the boat with the smallest Punk Perch but not consistant. 'Need to get in the tube with an intermediate line and cruise between the single stocks of weeds. Not-so-scenic Crooked Creek is also producing but=2 0expect other boats and incessant yaking echoing between the rock walls. Read the fine print under the title on the cover of Fly Fisherman magazine . . . "The quiet sport." . . . I wish. Check out the Crowley Cam!